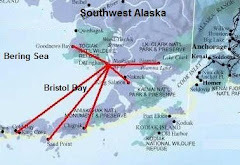 Bristol Bay Alaska incorporates over 30 villages. During my first four years as Pastor of Holy Rosary Mission, we have baptized 30 children into our Catholic Faith. The children were from many different cultures and backgrounds including Yupik, Hispanic, Thai, Filipino, Hawaiian, and Caucasian. 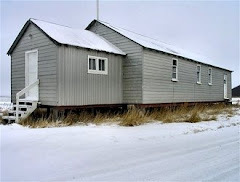 The baptisms took place in remote Alaskan villages such as Sand Point, Levelock, Naknek, Clarks Point, and Dillingham. These villages could only be reached by airplane. Here is a picture of our Cherokee Warrior II Airplane that I flew to most of the villages for the baptisms. This picture was taken Saturday, September 13, 2009 at the Levelock, Alaska airport. 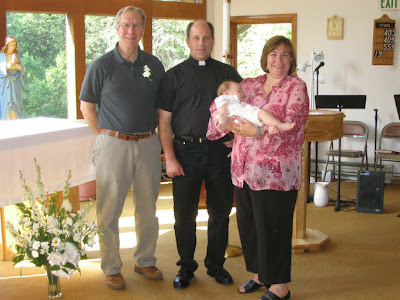 Little Joanna was the first infant I baptize as pastor of Holy Rosary Mission (December 17, 2005). 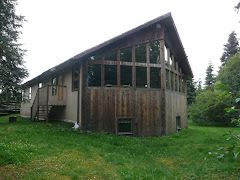 It was celebrated in Levelock, Alaska, which is about 40 miles East of Dillingham and has a population of around 70 residents. The baptism was done on the Bowden’s Kitchen Table. Little Joanna is shown on the left being held by her mother Napitie Bowden. Bonita is being held by a former Levelock teacher Becky Korwes. 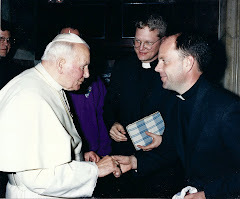 Hugh Russell was baptized July 9, 2006. He is shown being held by his Godparents Jeffrey and Anne Marie. Hugh is the child of Mark and Joan Reynolds. Venice Rain was baptized way out on the Allutian chain in a small village called Sand Point. Venice was baptized in a cannery, August 30, 2006. 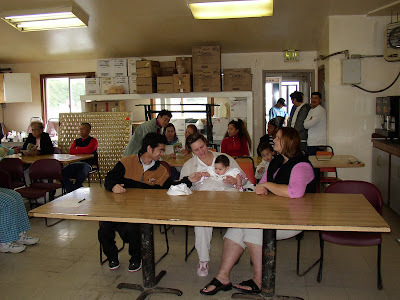 After clearing out the cannery cafateria, Venice, her mother Shawna, and a few friends are shown awaiting the baptism. 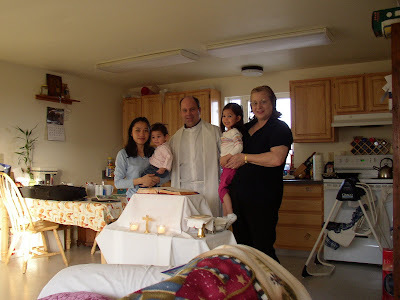 Katelynn was baptized August 17, 2008 in Dillingham, Alaska. 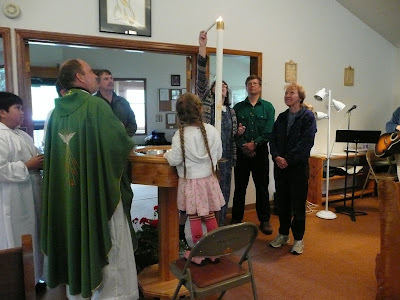 She is shown below waiting for the lighted candle, which Aileen, her Godmother, is lighting from the Easter Candle. Also shown are parents Michael and Diana (right) and Godfather Patrick. Joshua was baptized in Dillingham December 7, 2008. He and his sister both were baptized and received First Communion. Kara, Josh's sister, is shown below just after receiving the Sacred Chrism oil. Her mother June is shown on the far left and Godfather Robert on the right. Samuel James was baptized June 12, 2009 at Saint Peter the Fisherman in Clarks Point, Alaska. Clarks Point is 12 miles South East of Dillingham and can only be reached by air (boat in the summer). 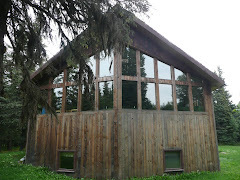 The church does not have heat so it can only be used for a couple of months during the summer. His mother Brittany Wassily is holding Samuel while Godparents Mariano and Justine look on. 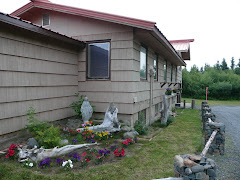 Kristina, Halle, and Raydon were baptized at Holy Rosary in Dillingham, Alaska July 27, 2009. The children's mother Christine is also shown. For me as a mission priest in a remote area where there are few inhabitants, this was an extremely rewarding and God-filled experience. Thank you to all the families who allowed me to baptize their children into our wonderful Catholic faith. It has been an honor! 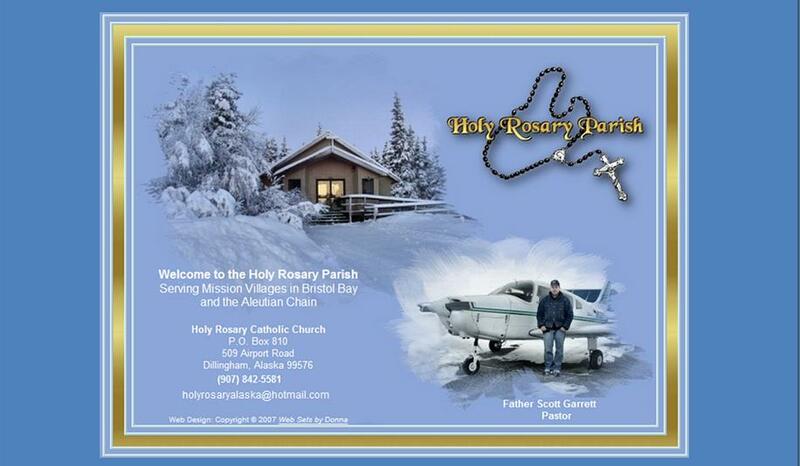 For the Holy Rosary Mission I am stationed in Dillingham, Alaska. I have always been impressed by the colorful dumpsters that are placed around all the businesses in this small Alaskan Village. In Dillingham there are dumpsters that are, well, special. What makes them so special? The youth around town have taken it upon themselves to use the dumpsters as a way of spreading good values and generally, using them as a medium to bolster spirits. These dumpsters are colorful, send a nice friendly message, and foster creativity. This creativity is a great way to put a little sunshine into the lives of Dillinghammers. Otherwise, the dumpsters would be kind of "ho hum." Here are a few more of those dumpsters. Have a great day and keep those creative juices flowing! Winter is quickly approaching and in the next few weeks our Cherokee Warrior II will be covered with snow and ice. Without a hanger, winter flying in the Alaskan bush requires an intimate relationship with the weather services, huge amounts of aircraft preparation, constant communications with villagers, and razor sharp landing skills for icy runways. Extreme cold temperatures, gale strength winds, dangerous icing conditions, rapidly changing frontal systems, three to four hours of light during the day, and severe snow storms demand that the upmost attention be paid to the weather report. As an Alaskan Pilot I call Kenai Flight service and Dillingham Flight service daily to keep myself continually briefed on all the weather conditions. Additionally I have my favorite internet site, http://pafc.arh.noaa.gov/tafobs.php. 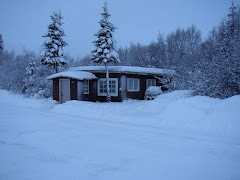 As a Catholic Priest who flies year around to some 20 small villages, I have developed certain rules for flying in the winter: (1) I do not fly when the weather is colder than 20 below zero Fahrenheit, (2) I will not land on a runway if I know there is fresh snow over 2-3 inches, (3) Depending on the wind direction at the airport I am flying to, I will not take off if the wind is gusting over 30 MPH, (3) I will not take off if icing is reported in the area. 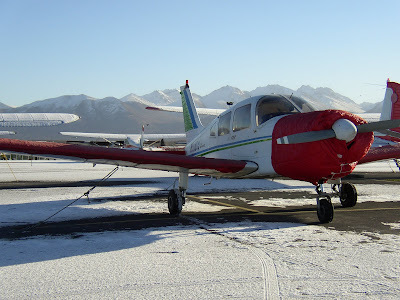 Bush Pilots always report icing conditions to the Dillingham, Alaska Flight Service Station. Once I have analyzed the weather and have deemed it flyable, I start aircraft preparation. 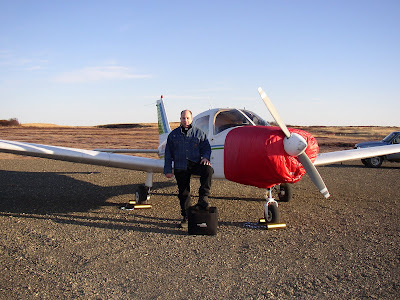 Because of the short daylight hours and the fact that many villages around the Bristol Bay area do not allow aircraft to land after dark, most of the preparation I do is in the dark. My Cherokee Warrior II is not parked in a hanger. Shoveling snow to be able to taxi, warming up the engine and cockpit, taking off wing and horizontal tail covers, breaking ice off the fuselage, wrestling with the frozen tie down ropes, and ensuring ice has not inhibited the flight controls all have to be done before I can finally start the actual pre-flight inspection. 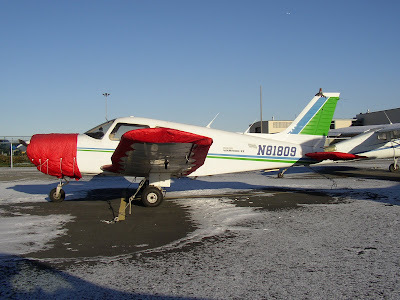 Here are two pictures of our Cherokee Warrior II in full winter uniform. 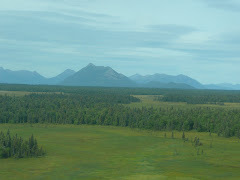 These pictures were taken after flying to Anchorage Merrill Field Airport from Dillingham. Anchorage is 325 miles North East of Dillingham. (6) to fly to Clarks Point and back during the winter, which is only 12 miles away, it may take eight hours if the preparation time is included, i.e. plugging in the plane early, shoveling snow, taking off, and putting covers back on, etc. Make sure you give yourself enough time to prepare. Here is a picture of where I plug-in my Tanis Engine Heater. Last winter when it was a -20 degrees, there was ice in the plug-in socket. I tried to clear it out but ended up punching the receptacle right through the fuselage. It actually made the connection and my engine was warm when I came back out in four hours. Tibbett Airmotive replaced the receptacle and put a red light above it so I know when electricity is reaching the engine. 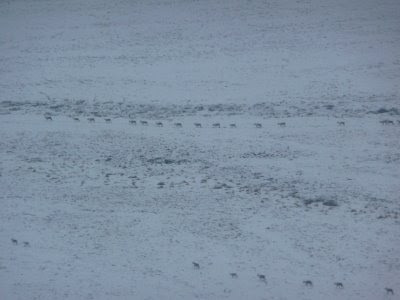 Benefits to all the aircraft preparation come in the form of easily visible Caribue heards roaming across the snow. 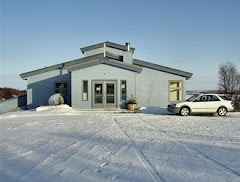 This picture was taken near King Salmon, winter 2008, while I was flying there to offer Mass. Click to Enlarge. Last winter a lady died waiting for a villager to pick her up after being dropped off by a bush pilot. The lady had assured the bush pilot that someone was on the way to pick her up. She froze to death. Good communication is crucial when flying in sub-zero weather. The first thing I did when I got my Cherokee Warrior II was to have a marine radio installed. People in all the small villages I fly into monitor marine radios. Every village has a specific frequency, i.e. Levelock channel 14, Clarks Point 11, Ugashik 18. After contacting the village through phone or email, and after setting up a pick-up time (parishioners normally pick me up on a snow machine or four-wheeler), I always call them on the marine radio when I am about ten minutes from landing at the runway. That ensures that someone will be waiting when I get there. Although it doesn't look that cold, this picture was take when the temperature was 2 below zero Fahrenheit. I did not have to wait long before someone picked me up here. This runway at Manokotac, Alaska is perfect for landing in the winter. One can still acutally see gravel. Usually we are not so lucky! 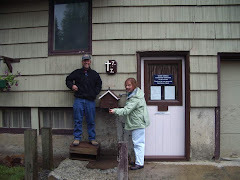 Ground time in an Alaskan Village has to be closely monitored. First, there is no electric plug-ins in the small villages I fly into. That means that I have to immediately put on my Engine blanket after turning off the engine. 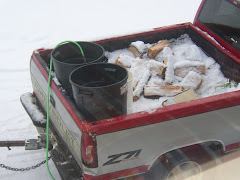 The blanket will keep the engine warm for about 2 hours and 30 minutes. Second, I do not like to fly in the dark (the risk factor for winter flying goes way up in the dark) and the days are so short I have to plan my mass celebrations accordingly. That is why much of my aircraft preparation is done in the dark. 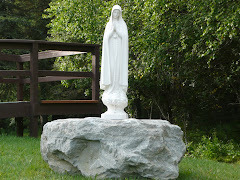 With mass, catechism, and some counseling or reconciliation, I am usually on the ground two hours or so. 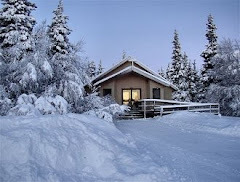 Levelock, Alaska Airport, two inches of new snow, sub-zero weather.